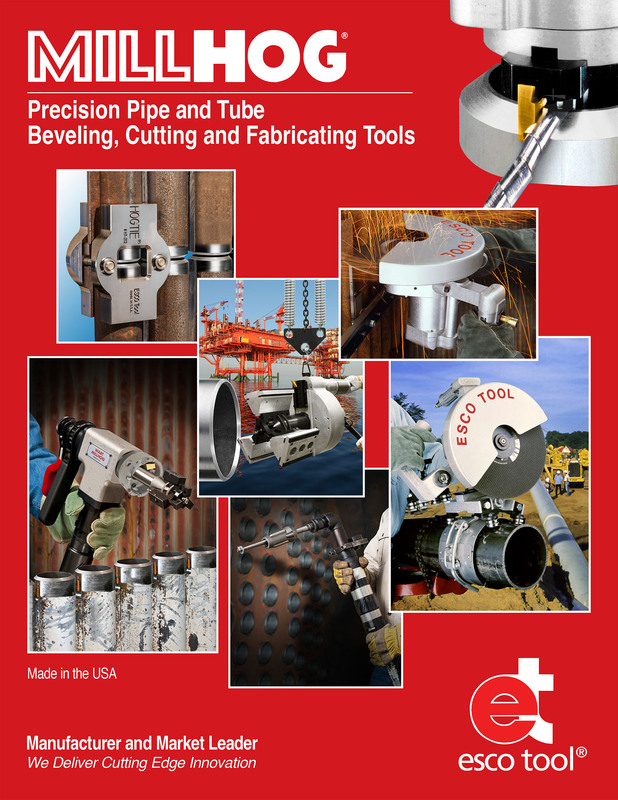 A new catalog featuring their broad line of pipe machining tools for end prepping pipe and tube along with saws and accessories for cutting pipe up to 60” dia. is being offered by Esco Tool of Holliston, Massachusetts. The MILLHOG® Precision Pipe and Tube Beveling, Cutting and Fabricating Tools Catalog is all new for 2016 and features a full line of tools for beveling pipe and tube from 1/2” I.D. up to 36” O.D. and cutting pipe and concrete up to 60” O.D. Most tools have upgraded air motors which provide the optimum combination of horsepower and torque and many tools are now offered with electric- and battery-powered motors. Developed for boiler tube fabrication and repair as well as cutting and prepping piping for process, petrochemical and structural applications, the 36-page MILLHOG® Precision Tools Catalog includes product descriptions, photographs, and specifications. New tools include the C-Monster® larger O.D. clamping tool, the Hog Tie® boiler tube and pipe weld alignment tool, and a wide range of tube expanders. The MILLHOG® Precision Pipe and Tube Beveling, Cutting and Fabricating Tools Catalog is available in hard copy or online for download.